I’ve been so busy I haven’t had a chance to catch you all up on some new products I’ve been using and projects that are moving forward. You know I mentioned the Ruger SR-22 .22 LR plinker wasn’t all I hoped it would be — an SR9c or LC9 clone in .22 — but that it was still a neat little gun that I decided to keep. Well, if you’re going to keep it, you need something to carry it in. For that I went to my friend Rob Leahy at Simply Rugged Holsters in Prescott, AZ. I have at least half-a-dozen holsters from Rob, and I used them more than any other of my far-too-many holsters. That’s because they simply work better than most of the rest. 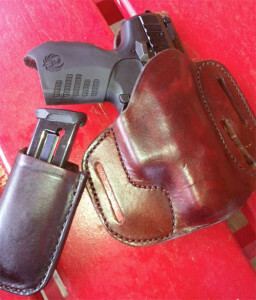 Take a look at this Cuda holster for the SR-22 and its accompanying magazine pouch. Heck, it’s simple! Three belt loops give you some options…traditional strong side, cross draw. It protects the little gun. It provides an easy draw. It is all-day-wear comfortable (easy to forget the thing is on!). Rob’s Sourdough Pancake holsters are the most versatile holsters made, and they conceal a big revolver amazingly well. Visit his website, and don’t overlook the best ammo pouches in the world. Rob is a real gentleman and builds only the best….here’s what’s weird…in a world of dreadfully expensive leather goods, Rob is holding the the line on holsters for working men and women! You guys also know I’m pocket pistol sort of guy. For years I’ve recommended the DeSantis Nemesis as my choice for pocket holsters. 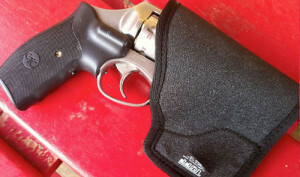 However, while I was out at GUNSITE last week I picked up a pocket holster from Tuff Products for my Ruger LCR and 101. You know I’ve raved about Tuff Products’ Quick Strips and carrying pouches for the same. Their pocket holsters live up to the raves for other Tuff products. This is an excellent pocket holster and it has been drafted quickly into service! My Sweetie’s 1911 Tactical Solutions .22 (on a Kimber Target frame) with it’s new muffler. 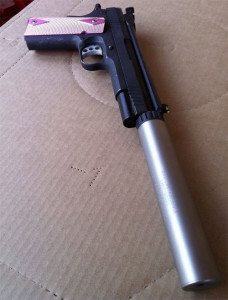 Finally, check out my Sweetie’s 1911 Tactical Solutions .22 (on a Kimber Target frame) with it’s new muffler. After a 7 month wait, the paper cleared on 2 of my suppressors, both from Tactical Solutions…a Cascade screw on (pictured) and a now-discontinued Sawtooth integral barrel for a Ruger Charger. 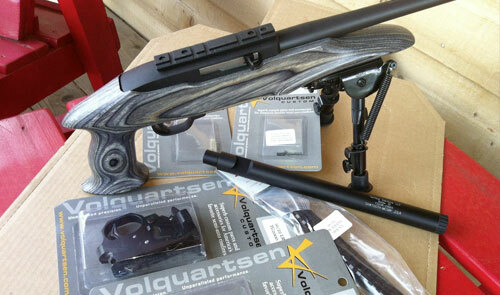 As usual, Project Charger will change over a lot of the internals to Volquartsen, my choice for the finest trigger group in the world.